Healthy, hearty and so super-hot right now (and always), blueberries deserve a permanent home in your garden. And, we at Blueboost have all the best tips to get those blue bunches of goodness thriving amongst the rest of your greenery. After all, we do supply around 70% of SA’s blueberries to retailers in SA. Although a bit tricky to grow, the humble blueberry needs some extra-special love to truly thrive, but with our key pointers you’ll be a berry-growing connoisseur before you know it and it’ll be SO worth it! SA is a lot warmer than the blueberry’s native USA home, but there are some berry breeds from the southern states that will be just as happy in your garden. Our Blueboost advice is to go for those in the Southern Highbush category – and don’t forget to get more than one variety so they can cross-pollinate. Blue Delite Nursery, at the foot of the Outeniqua Mountains, specialises in a number of blueberry varietals, or if you’re in Joburg try the Lifestyle Home Garden to start your own proudly blue garden. Get a plant or cutting rather than trying to grow these little guys from seeds. And, because they’re just so loved in SA, its super simple to find a young plant that will pop off a blueberry or 20 in less than a year! Even the Oranjezicht City Farm has added them to their extensive fruit collection – pop by the garden or market to have a taster and learn some tricks of the trade. 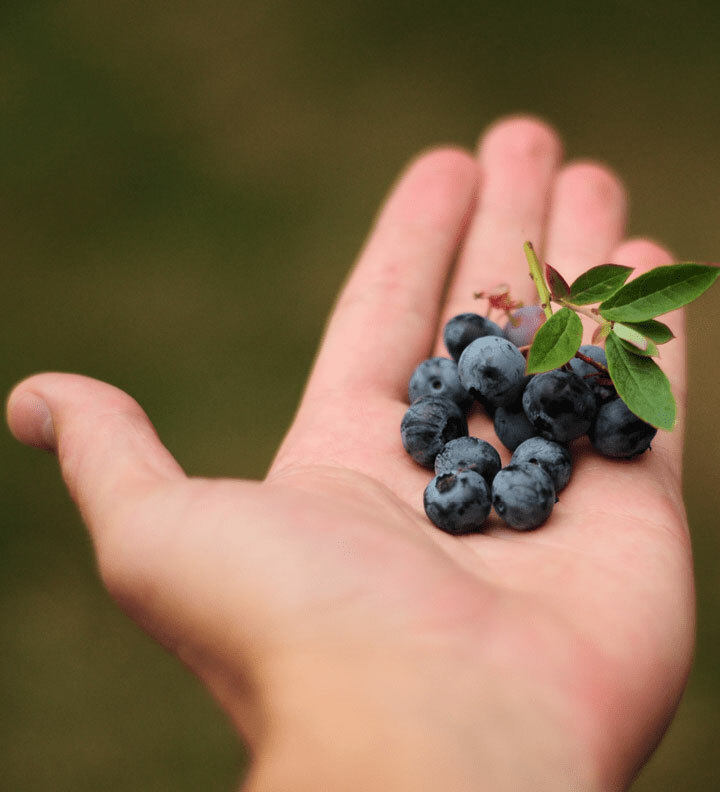 The blueberry likes its soil to be very acidic, which means it won’t be happy in our natural SA dirt. Plant your blueberries in a pot so you can regulate the acidity without spicing up an entire garden bed. Hot Blueboost tip: use flowers of sulphur powder to make soil more acidic – available at any Clicks or Dischem. To maintain a low PH level you’ll also need to hydrate with acidic water. Either strictly use only rainwater, or in a pinch, add a dash of vinegar to tap water. Well, actually they all like it hot. Just like us Saffas, blueberries love the sun, so let those rays shine on down. Be careful of those real scorchers though, the African sun can be a tad stronger than these berries are used to. When it’s a particularly hot day, give them a bit of a shady breather and a little more (acidic) water to replenish them. Give the plants an extra boost with a teaspoon of acid-loving fertiliser every three weeks to get them through the dry summers. Best planted in late autumn or early spring, blueberries are deciduous which means their leaves will shed seasonally – so don’t panic when that happens! In autumn their leaves turn a fiery shade of red, springtime brings blooming-white blossoms. The stars of the show, the berries themselves, will start popping up late spring, ripening in time to be a refreshing delight in summer. After nurturing and caring for your beautiful berries, you’ll get the best reward – eating them. Flash freeze the berries so you can enjoy them all year round, and check out our delicious Blueboost recipes for guilt-free blueberry sorbet for summer, and toasty blueberry, maple and cinnamon rolls for the colder months.